The COOL TIMER™ 2-hour automatic timer will automate your outdoors, hassle-free. Just connect and set the COOL TIMER™ to your desired time increment and program your favorite lawn & garden products to turn ‘OFF’ independently following completion of the time allowance. 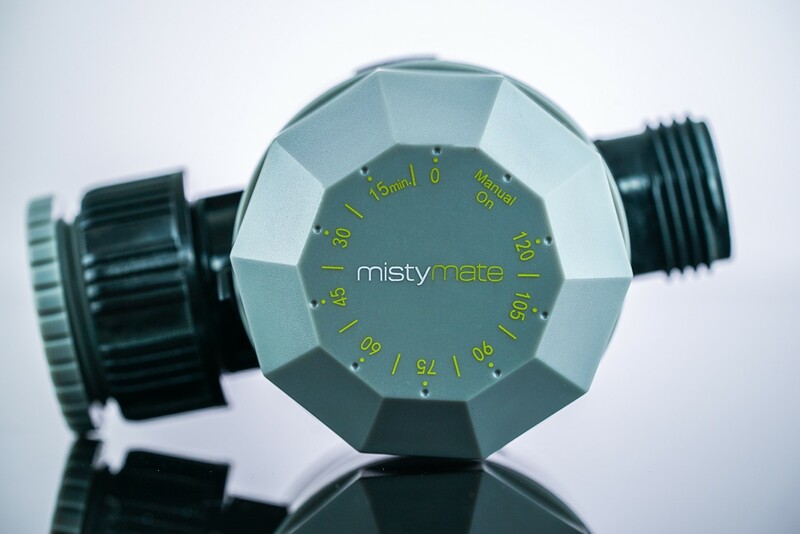 The COOL TIMER™ is designed specifically for use with MistyMate® misting systems but is also compatible with most other lawn & garden products that utilize an outdoor spigot. Compatible with all 3/4” spigots. The COOL TIMER™ can be set at 15-minute increments up to 2-hours. Mechanically operated, no electricity or batteries required. • Connect COOL TIMER™ top side “A” (Female) securely to outdoor spigot/faucet or water source. • Connect COOL TIMER™ bottom side “B” (Male) securely to desired ‘mist-cooling’ or ‘lawn & garden’ product. • Select desired time increment and manually turn water source ‘ON’. • When time expires, water will turn ‘OFF’ automatically. To allow constant water flow, turn Timer Dial counterclockwise until reaching “Manual On’.